Jim and I set off from Phoenix early Friday for Santa Anita to watch a good friend of ours run his horse on Sunday. Driving steadily and only stopping to pick up beef jerky and some bloody mary mix at Daniel’s Really Good Fresh Jerky in Quartzite, (you can visit their site here, http://www.reallygoodfreshjerky.com/, try the Rosemary Garlic Beef ), we managed to arrive there early enough to get the WiseGuy into action for the races Friday and Saturday. Friday we cashed several but nothing to speak of but let’s just say Saturday was a different story. 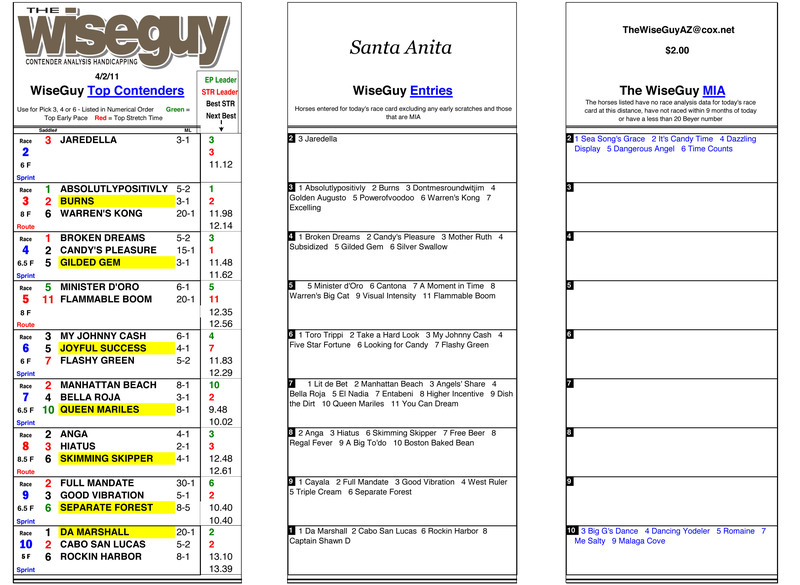 Below is The WiseGuy Betting Sheet for our Santa Anita Pick 4 for Saturday 2, 2011 along with the payout. We played a $27.00, .50¢ Pick4 dropping the 3 horse from the 8th race because of other reasons. 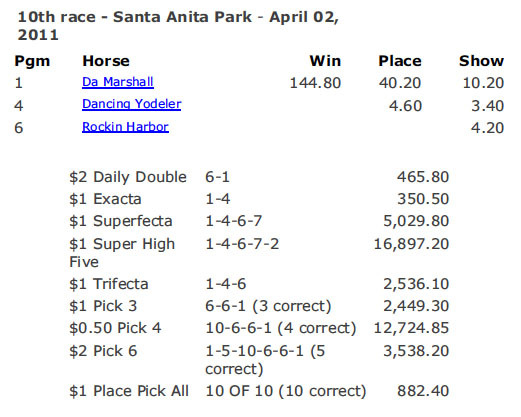 Highlights in yellow indicate a hit within the late Pick 4. We also dropped the 1st race because we ‘forgot’ to bring the 10 race program. This is why you see the card start with Race 2. WiseGuy is setup to do 9, 10, 11, and 12 races per race card as of today. Future updates are in progress.